There are a very few things that I am especially particular about. The rest of things, I am only mildly particular entirely obsessive about. The very few things are extremely important to my day-to-day well-being and overall happiness. They include; earl grey tea, in a nice cup, sometimes with a saucer, proper bread, Violet Leaf hair balm (oh how I wish I were a part owner of that one), good chocolate. These few things are the things that I always buy. I need them. I have my specific kinds, brands, a handful of suppliers that I like. What is going wrong at the moment, is that the specific brands and kinds I have used for years – without changing or stopping or going off them – are changing themselves. First, it was the tea. The earl grey tea I had been buying since 1998 suddenly became not leaf tea but dust. Expensive, tasteless dust. Of course, I had to find a substitute, which was costly hard work. I’ve drunk every earl grey tea that you can buy in this country. None were ever as good. Still aren’t. Nice, but not the same and not as good. Then, it was the hair balm. For the past 15 years I have been using Violet Leaf hair balm. While it is expensive, it is simply the best hair product for me. It works when I have long hair, short hair, any kind of hair mood. One day, I buy my usual two jars, open one up and I find it has changed. The consistency is slightly different. Softer. Not as tacky. Smells slightly different too. At first I thought, a batch variation. Then I finished the first jar and opened the second. Same thing. The formulation had been changed. Not an altogether good thing. A permanent change. After the tea, it is the bread. One day dense and solid sourdough from of the best bakers, becomes suddenly the next week, lighter. And a bit lighter, and a bit lighter until I wonder why I am not buying supermarket bread at half the price! It doesn’t stop at the bread and tea – basic to my very survival. It’s the hair clips. Remember those imitation tortoiseshell hairclips? Once, you bought one and it lasted ten years! By the time it broke you were sick of the very sight of it. Now you’re lucky if they last a week. And the peg buckets that hang on the washing line, and the t-shirts and the sheets and, and, and. It goes on and on and on. But not only is the quality going down, the size is reducing. Dishwashing liquid used to be one litre; it is now 900 millilitres, washing powder has shrunk through concentration of the product – but is it really twice as effective? Am I actually only buying half as much? Products become 90 grams, hand cream, once 100 grams, now 75 grams – it is such a small difference you almost don’t notice, but it is less. Consumers are paying the same, for less. I studied economics at school. I had an excellent teacher, and she taught us many things. One of those things was price elasticity and demand. Price goes down, demand goes up. Price goes up, demand goes down. Easy. Not so simple any more. Price stays the same, quality goes down. Alternatively, cheap goods have so flooded our market, we don’t know what value is any more. There is insufficient demand for a quality product – even in the niche markets. Even among those who care about quality; they, we, are still buying cheap essentially disposable goods. And it is affecting our every purchase. I pay the same amount for tea, but the tea is of lesser quality. The bergamot is fake, the leaves seem to be the sweepings off the packing shed floor; but I am still PAYING for it. All I want is a decent cup of tea, a piece of bread and good hair. It really isn’t too much to ask, but I can’t buy the things I want, even if I am prepared to pay. I have heirloom china. It belonged to my great grandmother, and my grandmother. I have my own mothers’ Noritake tea set. Now if I go to David Jones and try to buy china, it isn’t made in England or somewhere else traditionally associated with porcelain, it isn’t made by hand, it’s made on a factory floor by a machine. It’s imperfect. Patterns are ugly, and sometimes crooked. None of this china will be handed down. No one will want it. I wish I had known. I wish I had bought a lifetime supply of quality goods. Of hot water bottles, and peg buckets and tea strainers and shoe horns and clothes brushes and the accoutrement for daily life. Everyday things that would be used, looked after and last. Sadly, it is not to be. Those days are long gone. Now I know how the elderly ladies feel. Sadly, I agree with my grandmother – and you! And as for Aldi tea – just, no. No. I buy tea from online stores, or Chinese grocers, which are hit and miss, but then I only drink Earl Grey at Grandma’s house really. This Grandma has a Mason Pearson hairbrush, which she claims to have had since 10 years old, when she lived in London. I coveted it so long she bought me one. The bristles began to fall out after two years. She sent it back, receiving a replacement and a letter vaguely hinting that the ravages of the colonial weather might have been to blame. You know what I call on that. The replacement is holding up, but it just seems more plastic than Grandma’s one, the bristles not as soft, and you can pull them out. It’s funny, I’m only 27 and I see and feel what you’re talking about. Especially seeing as I limit my consumer goods considerably – when I make a new purchase, it’s only *ever* because I expect it to last decades. Clothing I used to buy, I now wouldn’t look sideways at – the hems will fall and the shape pull awry within months. I don’t even think Weet Bix taste the same as they used to. Sheridan pillows we bought were disfigured beyond recognition after not even a year. Not sure about Aldi tea. 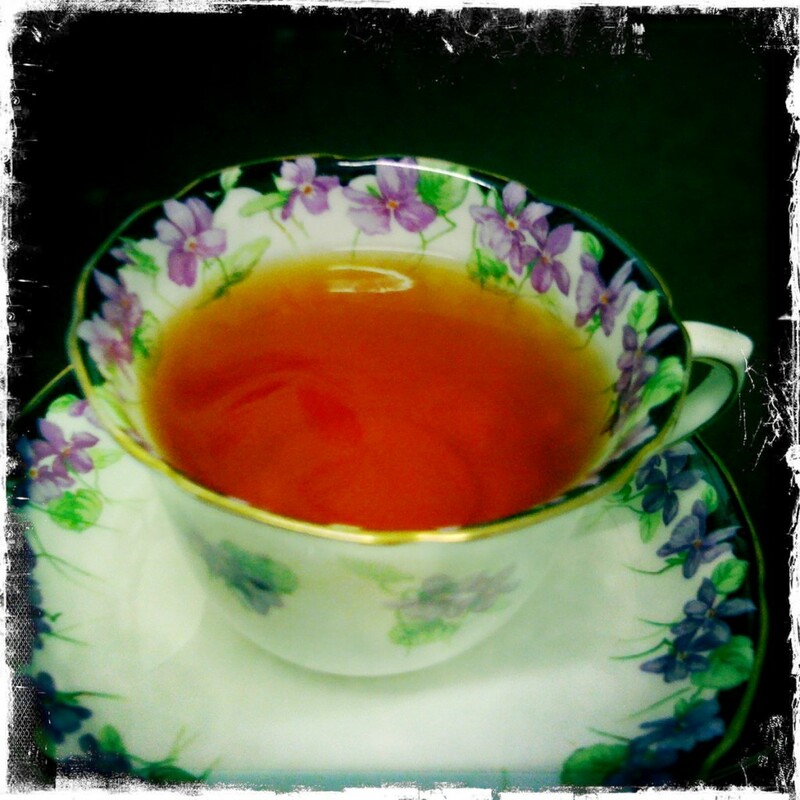 Mine comes from a specialty tea shop – ought to be good. It was good, once. Sigh. T2 is good for most tea. I like their French Earl Grey for the afternoons. In my next life, I will own a tea plantation in Sri Lanka so I can get it exactly as I like it! You are so right about tea choices,and we are so at the mercy of the big two supermarkets. I drink Madura tea, grown in northern NSW. Their English Breakfast is good, too. I had a friend visiting from the US, who wanted to know the brand, as he thought it was the best he’d tasted. Well of course, it’s Australian! :-) Is Aldi’s tea any good?………. Do not get me started on Earl Grey tea… I have taken to buying my supply at a local tea shop, so at least it is long leaf, not dust. But I still wonder about the Bergamot. And Sour dough! I want it dark, and dense and SOUR. If I wanted white fluff I wouldn’t pay $9 for a loaf. I too have heirloom china, I crave it, and search it out, because there simply isn’t much that’s new and good these days. I want detail, exquisite and minute detail. I want care and consideration. I’m more than happy to hand wash it, make it and I will buy it. But it’s easier to slap a stencil on, crookedly, and call it hand painted. I bought some beautiful, hand *cough* painted moroccan tea glasses. They cracked because the glass, although not fine is such poor quality. I know this makes me an old grumpy. So be it. I’ll brandish my last remaining hot water bottle and long, wooden handled umbrella at the sky and curse all I want! You are right, so right! BTW where did you get your long wooden handled umbrella??? Heirloom I suppose.